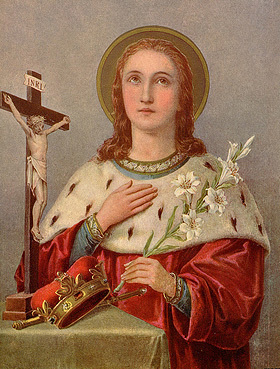 St Casimir was the third among the thirteen children of Casimir III, King of Poland, and of Elizabeth of Austria, daughter to the Emperor Albert II, a most virtuous woman, who died in 1505. He was born in 1458, on the 3rd of October. From his childhood he was remarkably pious and devout. His preceptor was John Dugloss, called Longinus, canon of Cracow, a man of extraordinary learning and piety, who constantly refused all bishoprics and other dignities of the church and state which were pressed upon him. Uladislas, the eldest son, was elected King of Bohemia in 1471, and became King of Hungary in 1490. Our saint was the second son; John Albert the third son, succeeded the father in the kingdom of Poland in 1492; and Alexander, the fourth son, was called to the same in 1501. Casimir and the other princes were so affectionately attached to the holy man, who was their preceptor, that they could not bear to be separated from him. But Casimir profited most by his pious maxims and example. He consecrated the flower of his age to the exercises of devotion and penance, and had a horror of that softness and magnificence which reign in courts His clothes were very plain, and under them he wore a hair shirt. His bed was frequently the ground, and he spent a considerable part of the night in prayer and meditation, chiefly on the passion of our Saviour. He often went out in the night to pray before the church-doors; and in the morning waited before them till they were opened to assist at matins. By living always under a sense of the divine presence he remained perpetually united to, and absorbed in, his Creator, maintained an uninterrupted cheerfulness of temper, and was mild and affable to all. He respected the least ceremonies of the church: everything that tended to promote piety was dear to him. He was particularly devout to the passion of our blessed Saviour, the very thought of which excited him to tears, and threw him into transports of love. He was no less piously affected towards the sacrifice of the altar, at which he always assisted with such reverence and attention that he seemed in raptures. And as a mark of his singular devotion to the Blessed Virgin, he composed, or at least frequently recited, the long hymn that bears his name, a copy of which was, by his desire, buried with him. His love for Jesus Christ showed itself in his regard for the poor, who are his members, to whose relief he applied whatever he had, and employed his credit with his father, and his brother Uladislas, King of Bohemia, to procure them succour. His compassion made him feel in himself the afflictions of every one.